Hey hi my fellow home chef who is trying to feed their family healthy (and possibly organic!) meals! 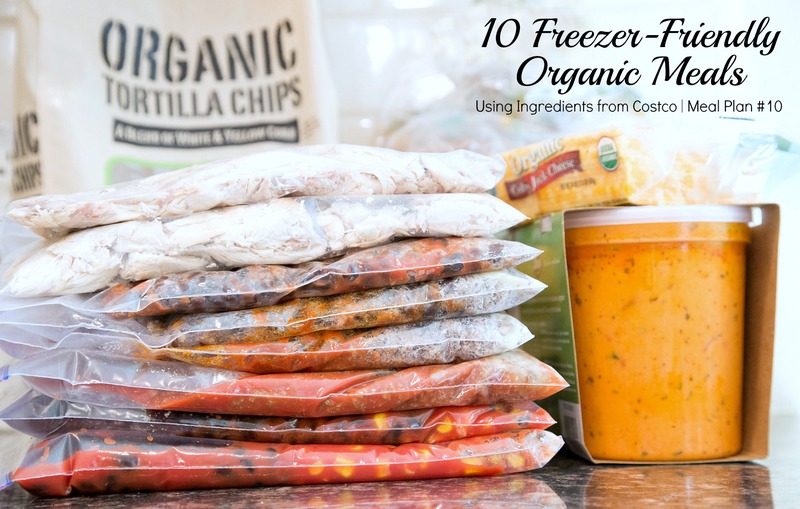 Y’all know that I love to ‘mix and match’ the bulk ingredients from Costco into delicious and amazing freezer cooking meal plans…and I’ve done it again for you…this time using all organic ingredients, sold at Costco. I don’t want organic meals to be too expensive for you. I want you to feel confident knowing that you’re feeding your family great food. I want you to use this tool and have this plan…to help your family enjoy organic meals without burning a hole in your budget. In this brand new organic ingredient meal plan, you’ll find 2 chicken recipes, 2 ground beef recipes, 1 vegetarian recipe. The meats and cheese make up over half of the total budget for the ingredients, and I’ve strategically used the different meats paired with other more inexpensive organic ingredients that Costco sells. It took me LESS THAN 1 HOUR of prep time to get everything into the freezer! Please note that the Basic Package only comes with the complete recipes and warehouse store shopping list. Each recipe in this plan is DOUBLED. The 5 recipes make up 10 meals. Each recipe is portioned to serve 4 adults. Larger families or families with bottomless pits (also known as teenage boys!) can double up and use 2 bags for 1 meal! I’ve also included suggested complementary side dish ideas on the recipes and shopping list! Can I get a YUM…kid friendly, family friendly, delicious comfort food for the fall!!! The total for all the ingredients after the leftovers $102! I mentioned this above, but in case you missed it. You can absolutely use this shopping list at any grocery store. The prices will be different, but the shopping list can be used at any store. And…if you can’t afford to eat organic meals, you can definitely use this shopping list and meal plan with conventional ingredients and stock 10 meals into your freezer in an hour!!! 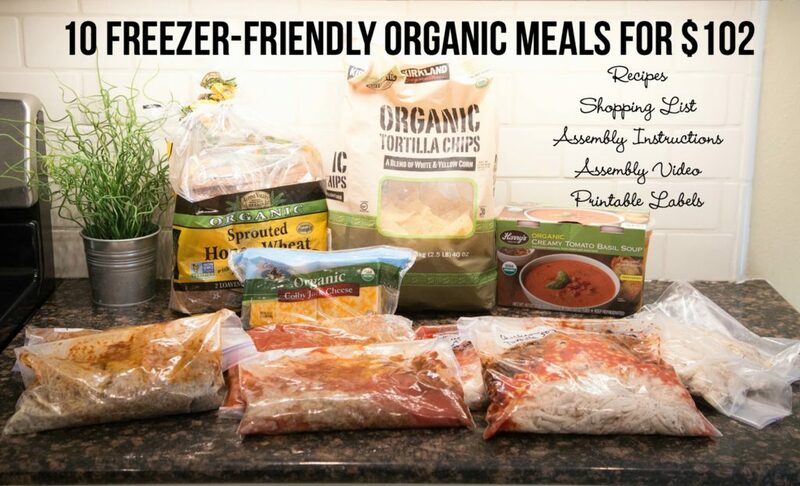 It’s time to grab your organic ingredient meal plan and get your freezer loaded with delicious organic meals…and then you can boast about not spending way too much on your organic ingredients! Let me make the experience of preparing these meals simpler and easier….I’ve done all the work for you, you just have to follow along and get your meals into the freezer! This first week that this organic ingredient meal plan is available, I’m throwing in 2 free bonus printables for you – my Costco Organic Ingredient Price List & Tips to Save on Organic Food. And don’t forget to check out all the other meal plans (including the popular 20 Meals for $150 Meal Plans, as well as 6-Week Specialty Meal Plans) in the $5 Dinners E-Store. Once you’ve chosen all the ones you need to make life in the kitchen easier, you can checkout and get all the printable at once! NOTE: Once your purchase is complete, you will automatically receive an email with the links to download your meal plans. The links will be sent to the email you used during the checkout process or to the Paypal email address you used to pay. Please download these files directly to your computer within 72 hours, then you can add to your e-reader/phone/tablet. If you have issues with the download, PLEASE EMAIL ME! I’ll be able to help you out! DISCLAIMER: I have no formal relationship with Costco and am not paid by them to share these plans. I created these plans to help myself (and you!) spend less money on organic ingredients sold at Costco, while using up all the bulk ingredients without them going to waste. Hope they help your family as much as they help our family! This is rather impressive to make that many organic meals for $100. Perhaps I should get a Costco membership. I usually go to Whole Foods for my smoothie greens and fruits, and that alone is $50-60 a week. I could only imagine how much more it would cost to make full meals from Whole Foods.